Home / Congress / India / Latest Post / Liars / Public Interest / Silly Nehru Cheer Girls!! This has become some kind of an annual phenomenon. And this phenomenon repeats itself at least twice each year. Not that the ecosystem ever stops bringing Nehru to any and every context that one can imagine. It is just that the jobless freeloaders usually get that extra kick during the death and birth dates of Nehru or else Nehru is in their pants and Nehru is in their shirts as Rahul Gandhi would have put it. You see, Nehru is an idea and ideas never die, a certain freeloader par excellence like Ramachandra Guha would thunder. The liberal cabal has even got shriller in last four years. This year being the penultimate year before the general elections, the expected shrillness in praising Nehru no end has crossed some bizarre level. This is what I always refer as the ‘cluelessness’ that the opposition exhibits. They have no agenda left to mount their fight against the present government. They even don't know how they want to fight. They never had any credible past either. So what is left to shout about is the false notion of Nehru that they have kept on selling to the nation for decades. Even that is falling flat of late since the masses have started rejecting this usual ‘snake oil’ which the ecosystem was busy feeding the populace for so long. The bastardization of our history for the sake of praising a handful of individuals for everything that they never were and they never were capable of is just part of the problem. One of the biggest beneficiary of this bastardization is a certain Jawaharlal Nehru and his family chain. I am not quite worried with that honestly, except may be for the fact, there is a bigger problem in whole of this. And the bigger problem is the belief that the ecosystem still carries. They still believe, they can fool the masses by the same falsification that they first experimented during early 1950s. I wouldn’t blame anyone from my generation for carrying that love quotient for Nehru. I even had lots of love for Nehru since he was dubbed as our beloved ‘Chacha’ in our school books. And as gullible as I was like most of the citizenry, I believed it too. When I was a kid, I once even thought if I could exchange my own grandfather for a far more loving character like ‘Chacha Nehru’. And trust me, my grandfather was the most loving grandfather one can be ever blessed to have. That was the kind of impact the lies projected in our books had on young minds. It still does even, which needs an immediate course correction. 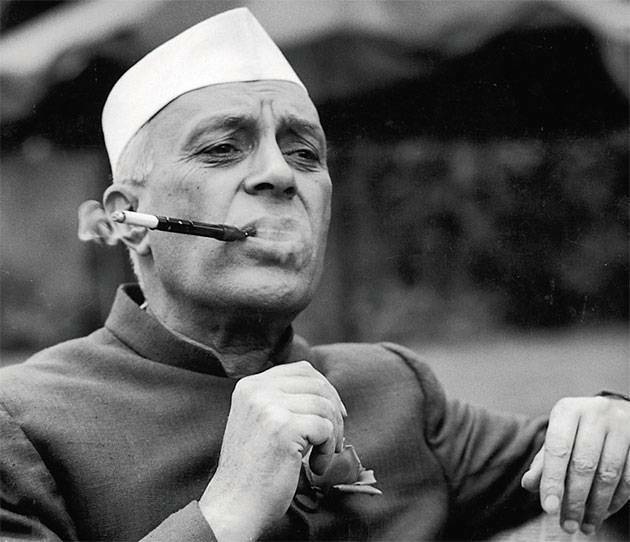 Only when I grew up, do I realize, what kind of monumental lies, not just the ‘Chacha’ part but most related to Nehru, were. There is no proof of Nehru being a children lover. I had asked many Nehru fan-boys to share at least one evidence of Nehru being an ardent children lover. I am still waiting for that one single evidence. Perhaps his love for children didn’t cross the boundaries of our text books and those rare couple of pictures (which these Darbaris keep on flooding every year) where Nehru was seen with some kids, all the while ogling lustfully towards their mothers. I can’t even remember (and no documented proof either) a single policy of Nehru as the PM, which he enacted specifically for the welfare of children. So how Nehru did a migration from being the plain ‘Vanilla Nehru’ to chocolate syrup dripping ‘Chacha Nehru’ is still a mystery to many including me. Even a bigger mystery – what kind of moron could comprehend and conceive enough reasons (which nobody knows) to name the birth anniversary of Nehru as ‘Children’s Day’. But much on this later. This year was no different on Nehru’s death anniversary. Beyond the usual rant of him being visionary, compassionate and other such assorted and usual nonsense, there were actually few who even ashamed the much famed curse phrase ‘Servile Mentality’. The first exhibit is right here, a certain Nitin Pai. For all that I know about him, he is heading the ‘Takshshila Institution’, presumably a literate individual. Even his education couldn’t clean his mind of ‘Colonial slavery’. As Subramanian Swamy would put it – you only can feel sorry for these semi-literate morons who have such vast disconnect with the ground realities and yet blabber big on every opportunity offered. In other words, they call themselves intellectuals. For this slave, a PM’s worth is only countable if he/she can use the word ‘palimpsest’ effectively in a sentence. Is this the sole achievement of Nehru throughout his political career? May be, and in all probability, it could be. Still then, how does it fit in today when we have a highly inspirational young populace ready to take any challenge head-on? In the present scheme of things where does slaves like Nitin Pai and their over exposed colonial slavery fits in? Honestly I don’t know what on earth ‘palimpsest’ is and what it means. I am least bothered if my PM can effectively use this word in a phrase of the Queen’s language, which 80% of my fellow citizens know nothing about. But Nehru fan-boys are made up of such flimsy coherence. Remember when I said – I am still waiting for one single evidence of Nehru’s greatness from these fan-boys. For response I always have these Nitin Pais of the world to share such acute sense of slavery as proof to how Nehru was a great leader. 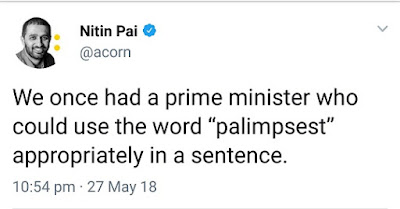 As somebody correctly said – “Anybody who judges Prime Ministers by their ability to use the word palimpsest effectively is very likely an Idiot”. And I am sure Nitin Pai is one. But Nitin Pai isn’t the only idiot around here, there are many. Their voices are becoming shriller, partly because their existence is in question and other being, they are desperate for their master’s survival. Only option left, latch on to yesteryears figures and draw larger than life image (which these figures never were) with a hope, voters would count such stunts while voting. Savarkar’s birth anniversary falling within couple of days of Nehru’s death anniversary is another arsenal that these selfsame colonial slaves never miss to exploit. Though these fan-boys never manage to share a single credible leadership quality of Nehru, they leave no chance in demining Savarkar in the same breath, of course with another set of falsification. Lies are what these slaves’ best manage to offer – be it while praising Nehru or when demining Savarkar and other real heroes of that era. Direct one-on-one comparison, you see? In one of my earlier posts I tried to bust the myth around Nehru as a freedom fighter and his so called jail term. One grudge that these slaves never fail to produce is how Savarkar begged mercy from the British. I am sure, most of these slaves would struggle to tell for how long Savarkar was jailed in a highly inhuman surrounding like the Andaman. In that post I asked – how much time Nehru would have taken for pleading mercy, had he been subjected to even half the atrocities that Savarkar had to go through. My optimistic guess was at most a month. In fact he may not had survived for a month. The real threats to the Queen were bundled to places like cellular jail or hanged while insubstantial freedom fighters like Nehru were put in jails as farce. Had Nehru been a real threat, I don’t understand why the British would have spared him with farcical jail terms? Most of those who usurped power after the British left our soil are the least affected by the British atrocities. This can’t just be a coincidence. I didn’t see a single so called freedom fighter in the bad books of the ecosystem, who didn't have to suffer even a hundredth of what people like Savarkar had to. But this little piece of common-sense evades our jolly good freeloaders at extreme ease. Hate for Savarkar has a pattern and reason, lest we forget it. If we do we would render the greatest disservice on our intellect. Next inline in praise of Nehru was the street thug. In response to a genuine observation that street thugs like Rajdeep Sardesai can never achieve, he only has the usual gibberish to produce. He was jailed for 10 years, says the street thug. But what this Darbari won’t tell you is the vast difference in the condition that Nehru spent his jail term and those of Savarkar. Nehru and Gandhi were offered their independent Bungalows which these cheergirls refer as jails. In fact Nehru had the liberty to choose the colour of the curtains, which were blue. A little search would also let you know that the British also built a new Badminton court for Nehru to display his shuttling prowess while in jail. In contrast Savarkar spent 27 years of his life in a 6X3 Sq feet cell with barely any provision for light or fresh air. While Nehru was busy shipping his favourite Darjeeling tea Savarkar was given worm infested food. Savarkar was caned brutally on daily basis and tied to a crossbars like a bull to grind mustard for oil generation while Nehru was enjoying his game of Badminton. Whom these Darbaris are trying to fool is simply incomprehensible. Shamelessness scales the highest level when his advices were to get off Twitter and do some history reading. Really? A seasoned liar urging others to go over history? Laughable to say the least. Which history was he referring to, if at all one wants to read? The same history that was specifically written with all falsehood so that these self-serving characters like Nehru remain high in the eyes of the society without doing anything? Irony can’t be more humiliated than this. And yet people like RS wonder why slaves like him are looked upon as nasty ‘Dalals’ in public discourse. Next exhibit to vouch for ‘Chacha’ Nehru was some inconsequential novel writer. And the greatest achievement she could find to attribute to Nehru as a great leader were his 4 hours sleeping period. He was only sleeping for four hours – she tweets. Does this even qualify as an achievement of the worth that Nehru is projected to be? When Savarkar was getting his eyelids taped so that he can’t sleep, here is a cheergirl who is all over the place citing the minimal 4 hour sleep pattern of Nehru. Irony again. It amuses me even further when I see all these fan-boys struggling great lot to put forward a single credible achievement of Nehru to be called a great leader and even more comical, a great freedom fighter. Just imagine what impact such falsehood had on the populace some six decades back when we still have slaves who not only believe these nonsenses but also peddle such hilarious pointers. Looking at these slaves and their desperation in hailing Nehru as the best thing happening to India, one wonders how rotten our education system has become. There would be many who would be sleeping even less but they aren’t projected at par with Nehru. An average pickpocket in Pune railway station may be sleeping less than four hours. I didn’t find anyone hailing his sleeping pattern wherein he could easily be imparting far less damage to the nation than what Nehru did. Why not hail that chap if sleeping less makes you one great leader? 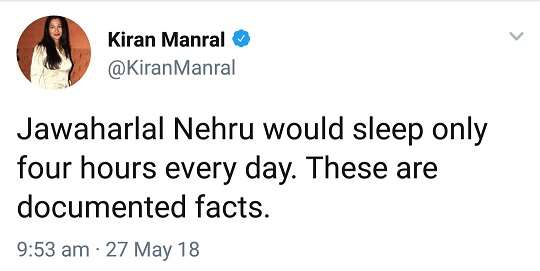 On the contrary, as I said, how much I wish Nehru had slept more than just four hours. May be 20 hours should have been best. He would have imparted far less damage to the nation than he eventually did. Can we really keep Category5Moron too far behind when we are discussing about Nehru fan-boys? It is simply impossible. There comes the biggest lie peddler among all. Like most fan-boys, she too didn’t have anything credible to offer in defence of Nehru. He wrote ‘Discovery Of India’ without referring anything. Seriously? Only a fool would believe so, which these cheergirls anyway are. From where C5M learnt that Nehru didn’t refer anything while churning out the nonsense which glorifies every invader with the brightest of lights? The colonial servile mind-set in the tweet was so totalling that it almost stinks like hell. Nehru could write the best of English one can, hence he was a great leader. This is almost elitist in saying, if one can’t blabber the Queen’s language with some authority he/she isn’t good enough. I haven’t heard a more childish argument in favour of a touted world leader ever. I never heard the South Africans claiming Nelson Mandela to be a great leader because he could write immaculate English. In fact you never would hear any great leader held as one for his English literary skills. You won’t because those are/were true leaders unlike Nehru who was a cosmetic freedom fighter and even more cosmetic leader. But C5M didn’t just stop at Nehru’s English skills. She exposed her servility further. Nehru could ride a horse like no one can could; he could swim like Dolphins without breaking a sweat and he also could put Baba Ramdev and Guru Iyengar to shame with his Yoga skills as well. Fantastic!! Little did I know, in a Prime Minister, I would be required to find a personal fitness trainer for me instead. How does Nehru swimming through the English Channel on daily basis matters to me? What in fact his Equestrian skills matter to the nation? 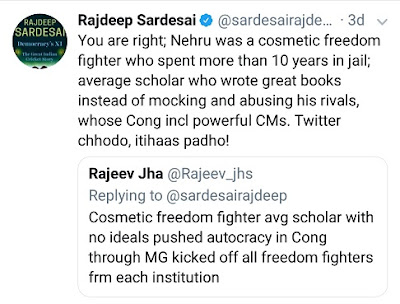 Didn’t I say at least thrice over this post that these fan-boys simply can’t produce a single credible characteristic or achievement of Nehru? They haven’t till date and I am sure they never would be because Nehru didn’t have anything significant to his credit to begin with. The biggest quality of Nehru was to usurp power by any means and making sure that only his family is benefitted at any cost. Whenever he was free from carrying out one hara-kiri or the other, he awarded himself Bharat Ratna. Perhaps Nehru remains great only in our text books and the free scotch circuits of the ecosystem. Beyond this, Nehru is as useful for the nation as Hafeez Saeed is for world peace. But we know what the truth is. Nehru and most down in his family were being sugar coated for far too long for us to miss the plot behind the setup. We can’t miss the irony anymore, can we? Systematically everything good with the nation was and still is accredited to just one family, as if the rest had no contribution at all and largely were just for namesake. Not just the Congress party and its slaves, most in the ecosystem are also trained to peddle as much rubbish so that the concocted image of Nehru remains intact before the masses. Doesn’t matter if in the process the real heroes were completely side lined, or worse, dubbed as terrorists. A sad reality to this denunciation comes in the form of poor Bhagat Singh. When needed, like during the Punjab election campaign, these selfsame Congress leaders put up a stamp size photograph of the great martyr beside Rahul Gandhi’s life size photo to usurp the opportunity while rest of the time Bhagat Singh remains a terrorist for them. Even a sadder reality is the government’s official martyr’s list that has no mention of Bhagat Singh at all. His family never received the freedom fighter’s allowance from the government as most other freedom fighter’s family do. The examples of systematic sabotage of real heroes and their works are ample with the Congress party. All is done with one single motto – no one should become larger than Nehru before the masses. Precisely the reason why a certain Savarkar or a Subash Bose appear like a thorn in Congress flesh. Giving Savarkar or Bhagat Singh their due would hamper the well-preserved falsehood of Nehru, which is simply not affordable. A convenient vote churning approach. All-in-all, I feel sorry for these Nehru Cheergirls. They are worst affected with this colonial slavery mindset. They are so much affected that they have become gullible by choice. They have lost their conscience, not just their voice. And all this quite willingly too. As I always say – slavery is very potent, more so when you are a self-designated slave in the Congress ecosystem.